Are You Losing Precious Samples Because of Your Vials? 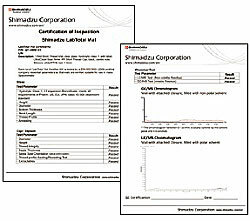 Adsorption of vials affects the accuracy of your analysis results. Some sample vials have low adsorption, but not consistent. 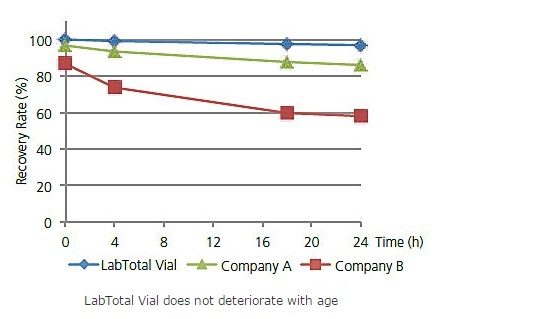 Other sample vials even have worse recovery rate of compounds. But now… you have Shimadzu LabTotal Vial! 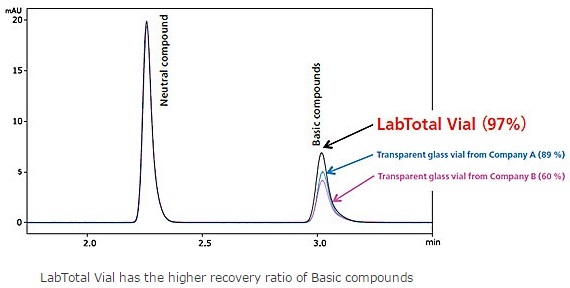 This improves quantitative accuracy in the analysis of trace basic compounds. This product can be used as a vial for high-sensitivity analysis in conventional LC and in LC/MS and GC/MS analysis. This shortens the time needed for sample preparation and reduces human error. 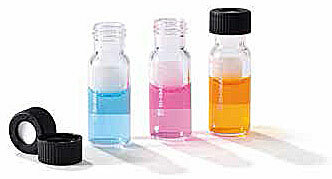 Adsorption of basic substances, a drawback of glass vials, has been reduced as much as possible. As a result, stable recovery rates can be obtained with no changes over time. This confirms that there was an absence of elution components from the vial in random inspections using LC/MS/MS and GC/MS/MS. Therefore, this product can be used with confidence, with no concern for ghost peaks originating from the vial. This product is designed so that the corners of the bottom of the vial interior can be reached by inserting a 100 μL scale micropipette tip obliquely, which increases the ease of use when inserting and retrieving samples. Also, marking labels, handy for note taking, are included with the vials.